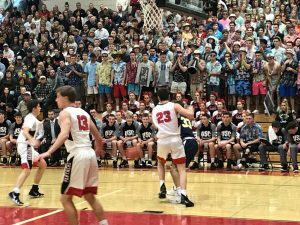 The Upper St. Clair boys basketball team will play Fox Chapel on Friday night at the AJ Palumbo Center located on the campus of Duquesne University. JV will play at 6pm and varsity to follow at 7:30pm. The night will also include senior night. The boys basketball team will be honored prior to the start of the game and the Dance, Hip Hop and Cheer teams will be honored at halftime. We will have pre-sale tickets beginning tomorrow morning. Feel free to stop by the athletic hallway or café at lunch. There will be a student bus leaving the HS at 6pm from the theater entrance. Please fill out the parent permission form below and give to Mrs. Tarcson.